Over/Under: Over 145.0 at 1.90 Bet Now! The EuroCup semi-finals get underway on Tuesday and we have two bets of three series to look forward to. Both of these come into this game with momentum and given that both sides grabbed an away win to book their place in this stage of the campaign, you can bet that confidence will be high. However, there can only be one team making progress at this stage of the tournament and we should be in for a cracking game in Krasnodar on Tuesday night. 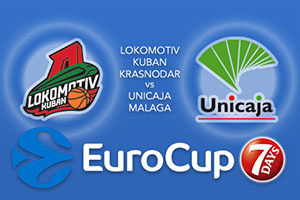 This is the first time that these teams have met in the EuroCup and both sides can boast of a strong record this season. The hosts have a 10-6 record at this point of the season and they overcame Zenit St Petersburg convincingly, ending the series after just two games. Malaga were the surprise outfit of the last round as they were the only team who managed to turn around home court advantage. FC Bayern Munich were in a fantastic run of form until the game in Malaga and then the Spaniards conjured up two wins to send the Germans out of the tournament. The win in Munich grabbed attention all across Europe. Mardy Collins has been a key player for Lokomotiv so far this season, offering an average of 11.7 points per game and 5.7 rebounds per match. There has been assistance from Matt Janning, providing an average of 11.5 points per game while Taylor Rochestie has offered an average of 11.5 points per game as well. Malaga will rely on Kyle Fogg, who has provided an average of 12.6 points per game this season while other players in double figures include Dejan Musli, with an average of 12.1 points per game while Jamar Smith has provided an average of 10.8 points per game. The bookies think the hosts will do what FC Bayern Munich couldn’t do last time around and take out Unicaja Malaga. Back Lokomotiv Kuban Krasnodar at -7.5 which is provided at odds of 1.90. For the Over/Under market, go OVER 145.0 which is on offer at odds of 1.90. Bet Now!